NOIR CITY once again offers the dark gift of film noir for the holidays. Why and What? 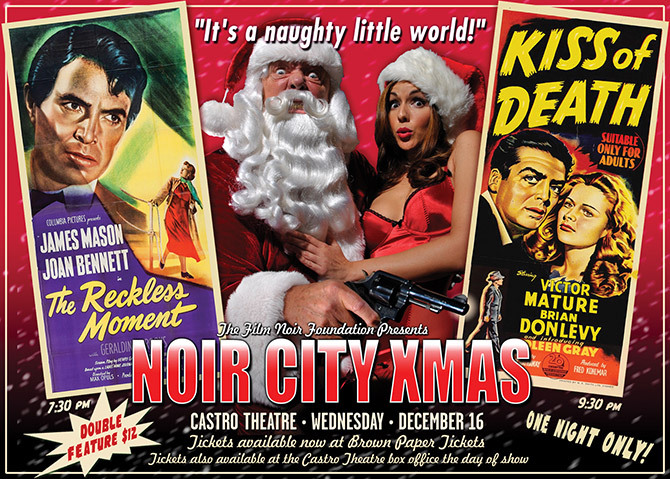 For a fabulous double dose of Noir Noël: Max Ophüls' The Reckless Moment (1949) at 7:30 and Henry Hathaway's Kiss of Death (1947) at 9:30. Both films will screen in 35mm, and tickets for this exceptional event are only $12 for the double bill—less than the cost of a single holiday eggnog at any bar in town! In addition to a seasonally themed double bill of vintage noir films, host Eddie Muller will be revealing the complete schedule (and scorching new poster!) for the eagerly anticipated NOIR CITY 14.